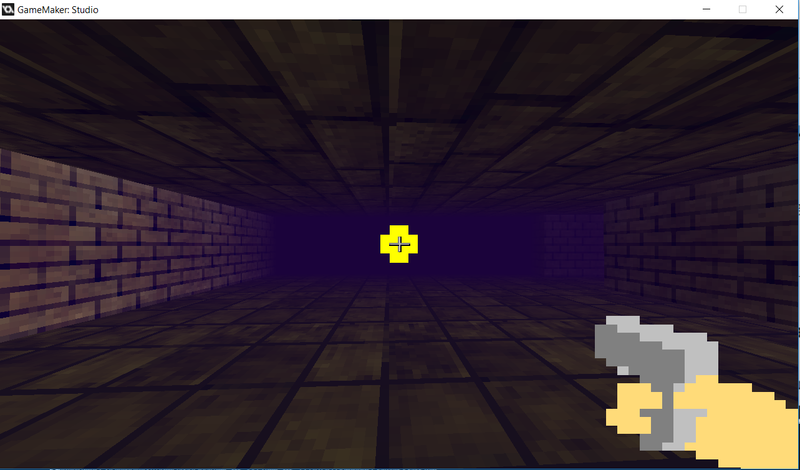 A simple first-person shooter engine (Game Maker Studio 1.4 source file) that can be used to quickly get a FPS game project up and running. Moving around with different footstep sounds depending on what you step on. 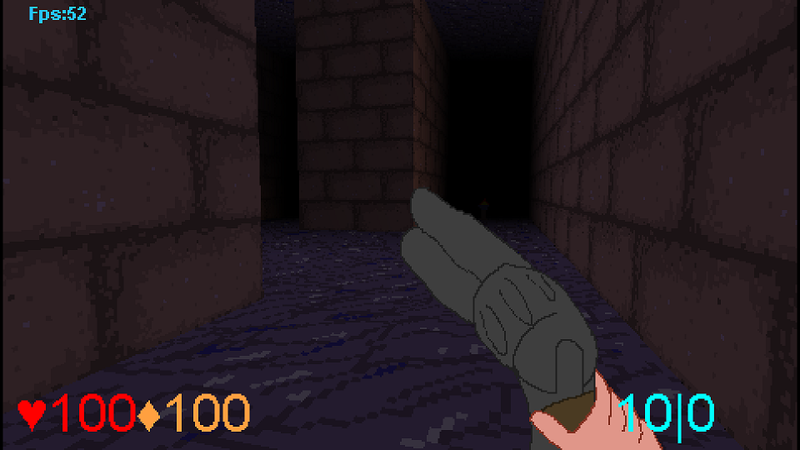 Fire bullets in any direction in three dimensions. Shield and health systems, dying when falling off the map or running out of health. Pickups for ammunition, health, and armor. Doors that open when you get near them and close again when you get far away. Levels can be designed in layers, giving simple 3D functionality to Game Maker's default room editor. 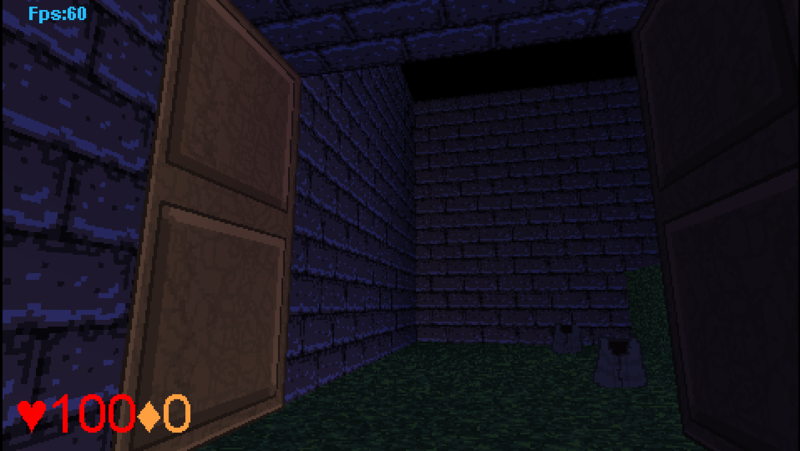 Seamless transition between different rooms letting you build levels made up from several small rooms. Are the walls made of d3d_draw_wall or d3d_draw_block or something else ? Depends a bit depending on which object, but most block-type objects are 4 d3d_draw_wall and 2 d3d_draw_floor calls (so the top, bottom and sides can have different textures). thanks. I'm making a 3D game and drawed walls wih d3d_draw_wall but it caused performance issues. I found a way to draw blocks with vertex buffer, it's a lot faster. Does this work if you export it as HTML5? No idea, I've never tried. The engine is quite a performance hog and the HTML5 version of GM doesn't have super good performance since it's doubly interpreted, and you'd lose out on both hardware-accelerated 3D rendering and hardware lights. Also I'm pretty sure the way the mouse position is read to let you aim with the mouse just wouldn't work in HTML5 (since you can't control the mouse position other than on the desktop ports, and the code is based on resetting the mouse to the center of the screen all the time so you get motion from its absolute position). Thanks, I'll look into it... arguments checking is a relatively new thing compared to how long the YaruFPS code base has been around. I don't remember exactly how the script works, it might be that it uses the same argument signature as the other collide scripts but doesn't actually USE all the arguments. Would be great if dear Yal improved this package more, so far it's bare bones. But I see the potential in here. Hello, I just downloaded the source code and I'm having trouble understanding a lot of the code. Mainly with the whole terrain and Level Grid stuff. I was wondering if you could maybe comment the code there a little more or elaborate on those a bit here? Thanks! I very much like this asset, there's a lot of good things here! Shouldn't be impossible, I'll see what I can do! The main idea is that you make the level in "layers" corresponding to different Z layers, then the engine puts them together when the room loads (moving everything to the first layer, and adapting their Z values accordingly). It's mainly there to make it easier to design 3D levels in GM's room editor and doesn't have any benefits other than that. There's also the terrain/ceiling-terrain (which is probably what I named "Level Grid" originally... was a while since I touched the source code last! ), which is essentially support for less rectangular ground, and which can be randomly generated. Its purpose is to make the ground in outdoors / cave areas look less like it's made out of cubes, but I couldn't figure out good ways to CONTROL it from within the editor, so it's a bit of an experimental feature. There's special objects that will generate (and draw) terrain if you place them in a room, TERRAINCONTROL and TERRAINCEILCONTROL, look into the init_terrain() script (which has a commented-out block of code that randomly generates terrain) and the "field" room for an example of how to use it. Wow. Okay I get it now thanks for your help and very quick response haha! This is a really awesome asset! Another quick question, if you increase the view distance and darkness then everything works good except the lighting still seems to pop in. How can I fix this? Try to avoid clustering too many lighting objects together, since only the 8 nearest ones are used (since there's a hard limit to how many lights the rendering system can handle) and which are the nearest ones can change suddenly. Okay so the problem was that only 8 lights are used at once. Its not that big of a deal though again thanks for the help. You and your asset are making learning 3d a lot easier for me! Hello I downloaded the source game file but whenever I boot up the game by running it in Game Maker Studio Pro. I receive this error when I press start on the main menu. Any solutions? I would really like to play around with the engine after paying for it. The script should increment the global counter, and if it's above a certain value (e.g. 10,000), set it to 0 and call d3d_transform_set_identity(). If you can confirm adding in some d3d_transform_set_identity() calls solves the problem for you, I'll get a fix for this into the source file ASAP. To extend the range of sight: obj_titlescreen's Create event, the code block labelled "Init global variables". There's two variables that controls this: global.darkness (which controls how far you can see) and global.activate (which controls when stuff is loaded in). Make sure global.activate is always bigger than global.darkness, or stuff will just visibly load in and it just looks weird. I'm loving the engine and the work you've put into it, thanks! -I want to alter the starting position of the bullet so it doesn't always spawn in the center of the screen, and instead I can alter it's starting coordinates so it always spawns at the tip of the gun (so I can move it left/right, up/down relative to screen, so no matter the size of the gun sprite I can always center it at the end of the barrel); I'm at work at the moment so I can't recall the exact names of the scripts but there was one with cx, cy, cz variables that I figured defined the bullet starting position, but no matter how much I played around with them I just couldn't get the desired result. -Another thing I need helping with is - I can't seem to find where I can set the size of the "level grid", that is, how do I define where is the border of the level itself and where the upper layers of the level begin within the room (I hope this question makes sense). For the second question... the 3D maths is kinda hard... which is why I skipped that part in the engine :P You'll need to find a reference point (e.g. the player's x, y and zbottom), then find the delta X/Y/Z to the tip of the gun, then spawn the bullet there. If you know the length of all the 'moving parts' (e.g. "spine", "shoulders" and "arm+gun"), you could just compute the X/Y/Z vectors of each part individually and then the tip of the gun should be there. Thanks Yal! The "layering" level 3D system is very clever. Regarding the positioning of the bullets - I got that eventually resolved on the GM forum, and you are right - it's very hard and I don't think I'm yet at the level to properly utilize them complex maths and matrices needed for what I'm trying to achieve. 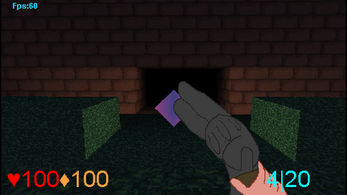 So I guess for now I'll just stick with the "gun at the center of the screen"
What is the easiest way to add a smooth crouching feature into this engine? Add a new variable iscrouching which defaults to false, is set to true in the step event whenever the crouching key is held (you'll need to edit the get_keys script to add in checks for the new crouch key) and false otherwise. Add in a new code block in the Begin Step event: when the crouching variable is true, lower zheight, movespeedmax and jumpspeed to something lower than their defaults, when it's false set them back to their default values. zheight in particular influences both the player's collision checking and where the 3D camera is located. If you want the camera position to smoothly move up and down, you could use the lerp function rather than setting the zheight variable directly to the values for crouching/standing. Would this work on GMS2? It should work in theory (since there's compatibility scripts converting the old 3D functionality into new), but I've had some issues converting other 3D engines to GMS2 so I can't say with certainty it will. (For instance, there's a bug with drawing transformed models with <1 scaling factors that causes massive slowdowns). Still a bit torn whether it'd be better to make a GMS2 version from scratch of all my engines or convert them and try to deal with version differences. At least it shouldn't be too hard to relearn Studio, it's basically GM8 with some stuff removed (execute_string() being the most important loss, a lot of people used that, and also sleep() and screen_redraw())... and some stuff added, like room/image editors where you can scroll and pan with the mouse wheel. Also, you can resize instances in the room editor now, which is wonderful for a lot of cases. Layers is a pretty major feature, and can be used in various ways... there's functions to only check a particular layer for instances/tiles, so you can have layers for each floor of a building etc. Views has been generalized to cameras, which basically is the d3d_set_perspective() function except it now can view 2D planes as well. You can have more cameras than you have views and switch what cameras are displayed in which view on the fly, letting you make dramatic camera movements and stuff more easily. Tiles has been revamped to allow autotiles and animated tiles, but this is mostly an editor thing. Backgrounds and sprites have been merged into one resource. Sprite editor supports layers for each subimage and you can draw while a sprite is animated, which lets you do some animations much easier.